Registration is now open for the International Society of Explosives Engineers' 45th Annual Conference on Explosives and Blasting Technique. It will be held Jan. 27 - 30, 2019, at the Gaylord Opryland Resort & Convention Center in Nashville, Tenn.
As many as 1,600 blasters, manufacturers, government officials and suppliers will gather from all over the world to gain new insights and form new business alliances. Participation will be strong as the largest conference of its kind in the explosives industry returns to Music City. The 2019 program includes a dynamic education program featuring technical sessions, poster session and workshops combined with more than 130 exhibits on the latest technology. In addition to the full conference, the Blasters Weekend Package, commencing on Saturday, Jan. 26, will include the popular Blasters Training Seminar, the Blasters R Us Video Roundup, a regulatory panel discussion and more. In addition, educational programs, books, DVDs and ISEE apparel will be sold at the ISEE bookstore, including the 18th Edition ISEE Blasters’ Handbook (print and digital) and the 45th Annual Conference Proceedings, featuring all the technical papers from leading industry experts. Calling all students looking to make a mark in the explosives industry! 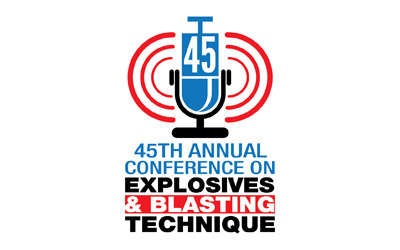 The ISEE Conference Program Committee is pleased to announce the Call for Student Papers to be presented at the 45th Annual Conference on Explosives & Blasting Technique, the largest gathering of its kind involving field blasters, manufacturers of explosives related products, educators and researchers, to be held Jan. 27 – 30, 2019, Nashville, Tenn. This is an excellent opportunity for students to network with senior researchers and professionals from academia and the industry. Ideas should be submitted in a 200-400 word abstract highlighting the major points of the proposed 8-10 page paper and be approved by the student's faculty adviser. Papers addressing all explosives and blasting-related topics will be considered. Accepted papers will be assigned to either a technical session or Blasters Forum Poster Session. Papers received by the deadline, with paid conference registration, will be published in the Conference Proceedings. Submit your abstract by Oct. 1, 2018. Exhibitor registration is now open for ISEE’s 45th Annual Conference on Explosives & Blasting Technique, scheduled Jan. 27–30, 2019, at the Gaylord Opryland Resort & Convention Center in Nashville, Tenn.
Don’t miss this opportunity to reserve space at the largest gathering in the world of its kind—bringing together exhibitors and buyers in the commercial explosives marketplace. As many as 1,600 blasters, manufacturers, government officials and suppliers will gather from all over the world to gain new insights and ideas and form new business alliances. Each year more than 130 exhibit booths are filled by recognized companies who showcase their latest technology, equipment, designs, products and services. Reserve your space today by completing the exhibitor acceptance and registration form and returning it with your payment. Exhibit space is assigned in the order in which applications and payments are received. We encourage you to reserve your booth online and view the floor plan. Act now to reserve your booth to ensure you are assigned the exhibit space that will best meet your organization's needs. Space is selling fast! Be sure to reserve your booth at the 45th Annual Conference and actively participate with the experts in this industry. Show your support and become a sponsor. See the last page of the exhibitor agreement for available marketing opportunities. This is an event you cannot afford to miss. Contact ISEE at (440) 349-4400 for questions and additional information. 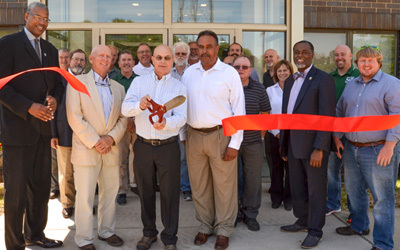 A ribbon cutting ceremony held Wednesday, July 19 at the new ISEE headquarters was attended by Brad Sellers, Warrensville Heights Mayor and retired NBA star, the ISEE Board of Directors and ISEE staff. The board of directors was in Cleveland for ISEE’s mid-year board meeting. ISEE President Jim Daley held the honor of cutting the ribbon and officially opening ISEE’s new headquarters. The mayor was then given a tour of the building before heading out to his next engagement. The 45th Annual Conference on Explosives and Blasting Technique will be held Jan. 27 - 30, 2019, at the Gaylord Opryland Resort and Convention Center in Nashville, Tenn. Exhibit booth space assignments will soon be underway with more booth opportunities than ever before. Organizations are invited to showcase their latest technology, equipment, design, products and services to the global explosives marketplace. To reserve exhibit space, contact ISEE or register online starting Aug. 2, 2018. As many as 1,600 blasters, manufacturers, government officials and suppliers from all over the world are expected to gather for this conference to gain new insights and ideas and form new business alliances. Participation is expected to be strong as the largest conference of its kind in the explosives industry returns to the Music City. This annual event is an international forum designed for the hands-on explosives user. As in past years, the 2019 program will include exhibits, technical sessions, panel discussions and educational workshops. The informative Blasters Training Seminar and the Blasters R Us Video Roundup are a few highlights of the popular Blasters Weekend package, which begins on Saturday, Jan. 26. In addition, educational programs, books, DVDs and ISEE apparel will be sold at the ISEE bookstore, including the 18th Edition ISEE Blasters’ Handbook (print and digital) and the 45th Annual Conference Proceedings. Created in 1974, ISEE is a professional association that promotes the safety, security and controlled use of explosives. The society has more than 4,000 members and 45 chapters from around the world.